This venture was first inspired by watching and reading Steve Jones’ (Blog|Twitter) PowerShell challenge. I always knew that PowerShell was a powerful tool and one that I needed to jump into at some point in my career. I dabbled with it some last year and did some small things, but it became more evident heading into this year that I needed to get more accustomed to all the intricacies and the usefulness I could gain from it as a data professional. One major paint point in automation portion of deploys was the fact of deploying .ispacs in SSIS 2012. Now granted the actual deploy is not cumbersome, in my opinion, Microsoft has done a decent job this go around with how to deploy with the wizard etc. However, a good developer friend of mine decided that he wanted to start out on the PowerShell venture as well and has since taught me a few things regarding deployments and how to utilize power shell. Who knew that developers and DBA’s could actually work on something and an idea together; just another step in bridging that gap. Keep in mind that the below code has dummy environmental variable and parameters for obvious reasons. This is just to provide an example and for one tweak it in hopes it may help another data professional at a future time. First line is the most important for this venture. It sets the parameter of what action will be taken in the script. After setting the variable for what action is being taken the next few steps will depict variable setup, loading the integration services assembly, storing the integration services assembly to avoid typing it every time, creating the connection to the deployed server, and creating the integration services object. $ProjectFilePath = "This is the location of where the ispac is located. For me it is getting the latest in TFS and then found on my C:\"
$ProjectName = "Insert the project name"
$FolderName = "Folder that the package will reside"
$EnvironmentName = "The environment name of the package"
$RPTServerName = "Server being deployed to"
$sqlConnectionString = "Data Source=$RPTServerName;Initial Catalog=master;Integrated Security=SSPI;"
Write-Host "Creating folder $FolderName ..."
Write-Host "Deploying " $ProjectName " project ..."
Write-Host "Adding server variables ..."
Write-Host "Adding environment reference to project ..."
Write-Host "Adding reference to variables ..."
Write-Host $project.Name "was deployed with"
Write-Host "Drop Environment Variable ..."
With any type of code you find on the internet it’s imperative that you test this on local machines or in a Dev sandbox before thinking of running in a QA, UAT, or Prod environment. What this has done is cut down my deployment times significantly and has helped improve efficiency. I always like a challenge and combing over this project and testing and re-testing proved fruitful in the end. For me it was worth it; hope others can get something out of it as well. A big thanks to Steven Robinson who was the developer mentioned on this project; Steven is one of the hardest working developers I’ve been around and the communication between the two units played a key roll in achieving in the end success. Okay okay, maybe DTS left a bad taste in my mouth or maybe it was because I’ve developed over 256 DTS packages and I still twitch at night. Or maybe I used the first edition of SSIS and while it was better than DTS I still wasn’t a fan; then one of my old colleagues touched base with me and told me that I needed to give the new SSIS version a shot. He was curious about what I thought, I reluctantly held him at bay for a while but then an opportunity presented itself one day last week. A current colleague approached me with an issue where he had some .txt files that contained SQL code in them that he was running manually. The first thing that popped in my head was giving SSIS another shot, I initially said no way not going there but figured ah what the heck – lets give it a try. 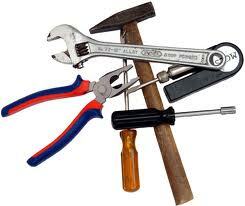 Now the task at hand was quite simple really and by no means did I over complicate anything. I just wanted to take the files and load them to help my buddy out. Took me all of 8 minutes to whip a quick package up. Below is a representation of how I accomplished this; I will try to elaborate step by step. I’m assuming that one already knows how to open SSIS in Studio……. Step 2: From the toolbox I selected my “For Each Loop Container” this will allow me to loop through “all” files that I’m looking for in my specified directory. Double click the Container and or go to the properties and you will be presented with the below window. For my testing purposes I created a test folder called Test1 on my local drive. The files that I need to loop through are .txt files; in my example I am going to load all .txt files within the directory. 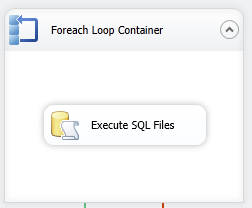 Step 3: From the tool box drag the Execute SQL Task over into the For Each Loop Container. 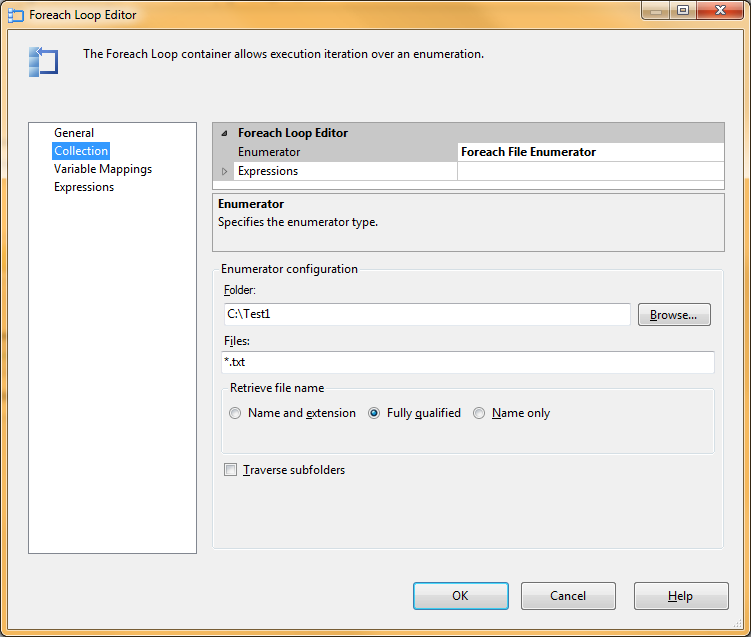 Double click on the Execute task to go to the properties section. The connection will need to be the connection from the Connection Manager that was setup in Step 1. Next the FileConnection will need to be the SQL connection set up in the Connection Manager that was established also in Step 1. Step 4: I always set up a SMTP Connection Manager so I can utilize the send mail task from the tool box. This allows for me to communicate on failure or success to the appropriate parties. Simply drag two send mail tasks from the tool box and in the properties section add your SMTP server and how you want to connect. 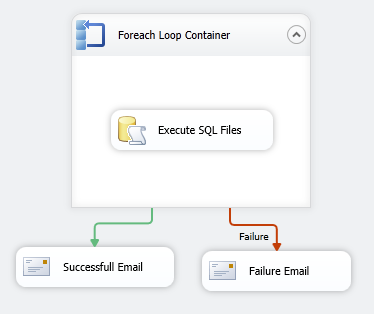 Click on the for each loop container and drag the arrow to your send mail tasks; to change for failure right click the arrow and select on failure. Pretty simple in a nut shell. I felt the tools were very easy to use and while SSIS does a lot more powerful operations this solution provided a way for me to loop through my files in the designated directory, load them in without issues, and a method for notification. Not covered in here but I will touch on is the fact that I liked the ispacs that deployment utility created. I found it much easier than using the manifest etc. All in all I was quite pleased.